By the time 2017 wrapped up, Bollywood had exhausted most of its reliable options and yet only a few had worked. Most of the bigwigs performed below expectations or sank without a trace. Movies like Jagga Jasoos, Rangoon, Jab Harry Met Sejal, Simran failed to impress, while anticipated movies like Raees, Tubelight, Toilet: Ek Prem Katha underperformed. Although there were a couple of small-budget movies like Secret Superstar, Anaarkali of Aarah, Hindi Medium and Newton that stood out, it was still a dismal year all in all. This year, however, Bollywood is on a roll. From the big league to small-budget movies, most of them have performed very well in India as well as overseas. To begin with, there was Padmaavat starring Deepika Padukone, Shahid Kapoor and Ranveer Singh that was already in news before its release due to the Karni Sena's disapproval. While it appeared for a while that violent protests might mar the film's collections, it only boosted the same. Padmaavat became the year's first blockbuster with a worldwide collection of an estimated Rs 580 crore. Sanjay Leela Bhansali's spectacular movie received mixed response from critics but was appreciated by the audience. It was soon followed by R Balki's movie Pad Man, starring Akshay Kumar, Radhika Apte and Sonam Kapoor. Based on a short story by Twinkle Khanna, inspired by social activist, Arunachalam Muruganantham's life, Pad Man was mostly well received. Although the movie made an estimated Rs 120 crore - an impressive number by itself - for an Akshay Kumar movie this was only average. Sonu Ke Titu Ki Sweety and Pari, starring Anushka Sharma followed PadMan. SKTKS is the underdog of the year so far, with an estimated collection of more than Rs 120 crore. Pari, on the other hand stood out as one of the best-performing Hindi horror flicks. Anushka Sharma may have just paved the way for A-listers to show some love to the much-neglected genre. Ajay Devgn's Raid, Rani Mukherji's Hichki and Tiger Shroff-Disha Patani's Baaghi 2 also were noticeable on the box office. Considering the subject matter and that it's Mukherji's first movie in four years, Hichki was well received. It received mostly positive reviews, with some calling it fresh and inspirational. Baaghi 2, on the other hand was widely bashed for everything it had to offer. Nevertheless, it went on to make around Rs 250 crore in the box office. Amitabh Bachchan and Rishi Kapoor recreated their magic at the box office with the comedy 102 Not Out. Made on a budget of Rs 10 crore, 102 Not Out made an estimated Rs 80 crore. It was soon followed by one of the year's most critically acclaimed movies, Raazi, that not only impressed the critics, but also set the cash registers ringing. The Alia Bhatt-Vicky Kaushal starrer, directed by Meghna Gulzar, made almost Rs 200 crore in the box office. John Abraham's Parmanu: The Story of Pokhran made more than Rs 90 crore in the box office. It is, however, still running in theatres and is likely to continue its business for a while. The most eventful month for Bollywood this year so far was June. It saw three big releases, all of which performed rather well. 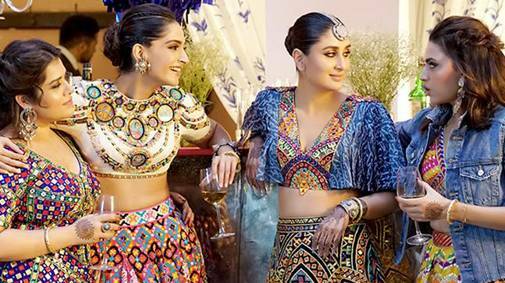 First up was Veere Di Wedding, starring Kareena Kapoor, Sonam Kapoor, Swara Bhasker and Shikha Talsania. As all female-centric movies go, most people found something to critique in the movie. Nevertheless, it became one of the biggest hits of the year with collections around Rs 140 crore. Salman Khan's big release, Race 3 that was released shortly after Veere Di Wedding, opened in the most explosive manner in box office, and set the cash registers on fire. However, the steam soon ran out as negative word-of-mouth dented the movie's collections. From direction and acting to music and plot, everything was bashed by the critics and audiences. The fact that it had a short life before the release of the much-awaited Sanju did not help matters. Nevertheless the movie made around Rs 300 crore. The year's biggest hit till now, breaking records, and steadily on its way to replace Padmaavat as the highest-grosser of the year in terms of worldwide collections is Sanju. It is already one of India's highest-grossing movies. In 16 days, Sanju, starring Ranbir Kapoor, made Rs 300 crore and is also one of the fastest movies to make Rs 200 crore. The movie is still running in theatres and has collected around Rs 380 crore in India so far, taking its worldwide collections to more than Rs 500 crore. Needless to say, there's more to come. While the first half of the year was encouraging, it is the second half that is anticipated to be the actual money-spinner. Upcoming movies to watch out for are Dhadak, Fanney Khan, Vishwaroopam II (Hindi), Gold, Batti Gul Meter Chalu, Sui Dhaaga, Thugs of Hindostan, 2.0, Student of the Year 2, Kedarnath, Zero and Simmba.